Suppose that you have a check that pays more than one kind of expense. To categorize a transaction like this, you use a split category. You trot down to the grocery store, for example, and pick up $10 worth of junk food and junk beverages (which you should categorize as a Groceries expense) and $10 worth of 10W-40 motor oil (which you should categorize as an Auto expense). Here’s how a split category works: When you’re ready to categorize the check, you click the Split button, and Quicken displays the Split Transaction window. The Split button shows two arrows that look like a warning sign for a fork in the road. Enter the first category name in the first Category field. Move the cursor to the Category field (if it isn’t already there). Activate the drop-down list box by pressing Alt+down arrow or by clicking the down arrow and then selecting the category name. (Optional) Tag the first categorized portion of the check. If you’re using tags to further classify your spending, move the cursor to the first Tag field and then type the tag. Enter a memo description for the first categorized portion of the check. Enter the amount spent for the first category. Move the cursor to the first Amount field and then type . . . well, the amount. If the first category is what you’re calling Groceries, and you spent $10 on this, you type 10. Repeat Steps 1–4 for each spending category. If you spent another $10 on motor oil, for example, move the cursor to the second Category field and enter the category and, optionally, the subcategory you use to summarize auto maintenance expenses. In the figure, for example, the category–subcategory combination Auto & Transport:Service & Parts is used. Optionally, tag the transaction. 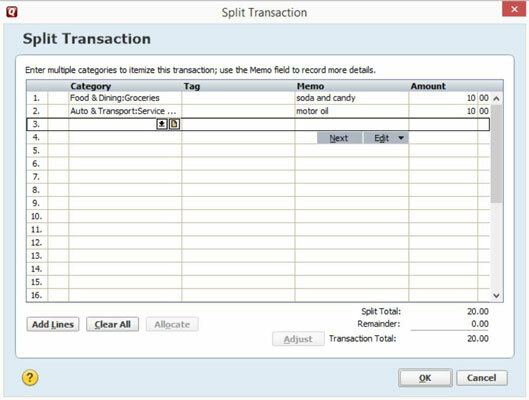 Optionally (again), move the cursor to the second Memo field and enter a memo description of the expenditure, such as motoroil. 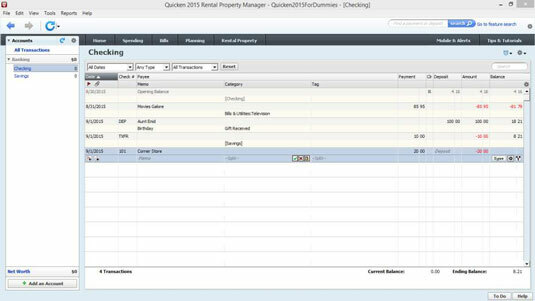 Move the cursor to the second Amount field and enter the amount of the expenditure, such as 10. The figure shows a Split Transaction window that’s complete. A split transaction can have up to 30 pieces. Use the scroll bar or PgUp and PgDn keys to scroll through the list of split amounts. Verify that the Split Transaction window shows no uncategorized spending. If you find extra spending — this shows up as the Remainder amount — either add the category you need or delete the split transaction line that’s uncategorized. To delete a split transaction line, move the cursor to one of the fields in the line and choose Edit→Delete. You can also click the Adjust button to get rid of the Remainder amount — but in this case, Quicken adjusts the amount originally entered into the register so that it agrees with the details you’ve supplied in the Split Transaction window. If you want to insert a new line, move the selection cursor to the line above where you want to make your insertion and choose Edit→Insert. If you’re fed up and want to start over from scratch, choose Edit→Clear All (which causes Quicken to erase all the split transaction lines). After you complete the Split Transaction window — that is, after you completely and correctly categorize all the little pieces of the transaction — click OK. Quicken closes the Split Transaction window. If you didn’t enter an amount in the Payment column of the register before opening the Split Transaction window, Quicken displays a dialog box that asks whether the transaction is a payment or a deposit. You select an option button to make your choice known. 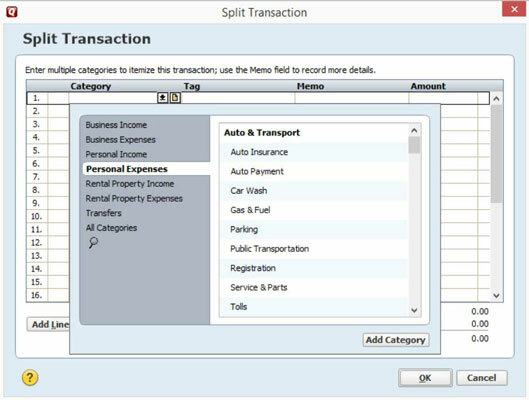 To let you know that the transaction is one that you’ve split, the Category field shows –Split– when you select the split transaction to show that you’ve split a transaction among categories or tags. This command tells Quicken that you want to record the transaction in your register.